Gritty, hard-nosed, blue-collar sports fans; The Steel City. Until recently, this was the reputation of the major city in western Pennsylvania, which lays half way in between New York City and Chicago. Today, Pittsburgh, has transformed itself into a metropolis with one of of the highest rates for quality of living in the Unites States. Home to one of the nation’s top medical centers, University of Pittsburgh Medical Center (UPMC), Pittsburgh is at the forefront of progressive medical innovations, business development and is home to many fine academic institutions including Carnegie Mellon, Pitt and Duquesne. With reasonable prices, vast options for accommodations and lively events, Pittsburgh, PA can certainly be a prime vacation spot or family trip destination. 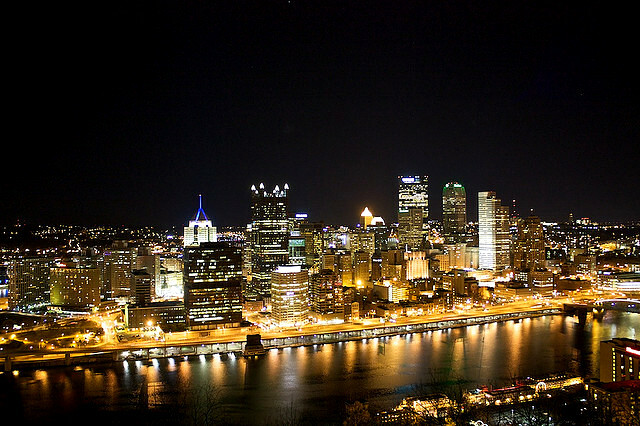 When approaching downtown from Pittsburgh International Airport, visitors travel through the Fort Pitt Tunnel and while exiting, are hit hard with a gleaming skyline and an assortment of picturesque bridges. There are not many cities in the U.S., if any, that can match this enchanting entrance in which Pittsburgh has to offer. In fact, Pittsburgh is actually host to more bridges than any other city in the world, including Venice. It is of course hard to think of this city without thinking about its storied sports history. Home to the legendary “Steel Curtain” Steelers defense of the 70’s and sports legends such as Roberto Clemente, Mario Lemieux and Dan Marino, Pittsburgh is rich in sports tradition—both past and present. Wiz Khalifa describes Pittsburgh best in his rap “black and yellow.” What other city can say that all of their professional sports teams rock the same colors for uniforms? 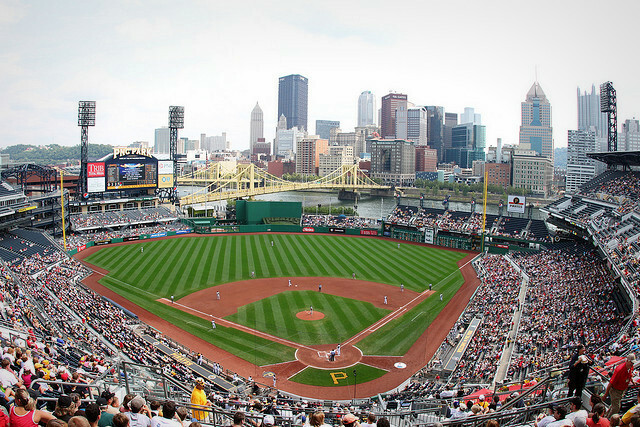 Enjoy part of your time in Pittsburgh sitting amongst the rocking fans at a Penguins hockey game, yelling with the strong steel spirit at a Steelers football game or taking in a Pirates baseball game at one of the nation’s most beautiful ball parks; PNC park; just be sure to wear your black and yellow to any of them! The museums of Pittsburgh offer something for people of all ages and interests. Whether you are interested in art, aviation, dinosaurs, music or more; there is a Pittsburgh museum for you. First and foremost is the Andy Warhol museum. This 7-story museum dedicated to the Pittsburgh artist who influenced the world through his artistic expression is a must-see which features exhibits of all kinds. Another great and unique museum is the Mattress Factory. Located on the north side of Pittsburgh, this museum of modern art is host to several permanent and temporary exhibits and includes hands-on activities, workshops and tours. Lastly, you cannot go wrong with the Carnegie Museum of Natural History. This museum is one of the top natural history museums in the country and home to one of the best dinosaur collections in the world. Oakland is the area of Pittsburgh that is best known for hosting the University of Pittsburgh. This urban campus is dominated by its 42-story Gothic-Revival Cathedral of Learning which contains 26 nationality rooms designed by different ethnic groups and is the tallest academic building in the U.S. Adjacent to the cathedral is the beautiful Heinz Memorial Chapel, a favorite for Pittsburgh weddings. Alongside the center of Pitt’s campus is the perfectly maintained Schenley Park which is home to Phipps Conservatory and Botanical Gardens; a great place for a stroll or post-up spot to indulge in a sandwich from Primanti Brothers—one of the most famous sandwich shops in the country, known for serving sandwiches stuffed with cold cuts, coleslaw, tomato and French fries. The university was built upon the grounds of Forbes Field, home of the Pirates from 1909 to 1970. On the Pitt campus still resides a section of the Forbes Field wall and enshrined within Posvar Hall is the original home plate; the site of Bill Mazeroski’s famed home run ending the 1960 World Series. Catch a college basketball game at the Petersen Events Center, home of the Oakland Zoo fan section, one of the most pulsating and rowdy home advantages in the country. Pittsburgh is a city full of vibrant nightlife. The best place to go out is the South Side and its strip, East Carson Street. This street is one of the most bar-packed streets you can find anywhere and is loaded with great restaurants, cafes and venues. One of the best spots is Charlie Murdoch’s—a dueling piano bar and exceptional experience offering great live music. Be sure to check out nearby Station Square; a very large indoor and outdoor shopping, dining and entertainment complex. Church Brew Works located in Lawrenceville was originally a Baptist Church. In 1996, it was altered into a brilliant brewery and restaurant like no other in the city. With very lofty ceilings, pipe organs turned into brewpubs and delectable food, this restaurant is inimitable. Try the delirious Untraditional Pittsburgh Pierogies or mouthwatering Buffalo and Wild Mushroom Meatloaf! Pittsburgh is home to one of the more underrated skylines in the country. Spending an evening riding the incline to the top of Mt. Washington for dinner is the best way to see this unbelievable panoramic view. There are a variety of restaurants located in a row on top of the mountain—each with glass walls for spectacular viewing of the skyline while you eat. Try La Tavola Italiana! This amazing restaurant has the view, the food and the ambiance for a great evening out; just no liquor license, so feel free to BYOB. We believe Pittsburgh to be a definite worthwhile visit and are hopeful that our Pittsburgh Travel Guide will lead you to a memorable experience! Oh I’m sure you’ll find a tasty chocolate morsel that will fit your fancy, but you can always rent a car and drive to Hershey, PA!